Here we are at the end of July which has NOT been a good month for us. But before I tell you all about that, I have to share a gem of a campground that Leo and I found a few weeks ago. 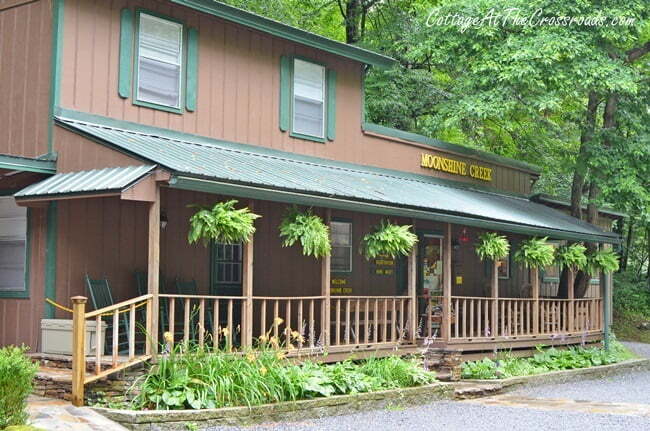 The name of it is Moonshine Creek Campground, and it is located in the Smoky Mountains of North Carolina. 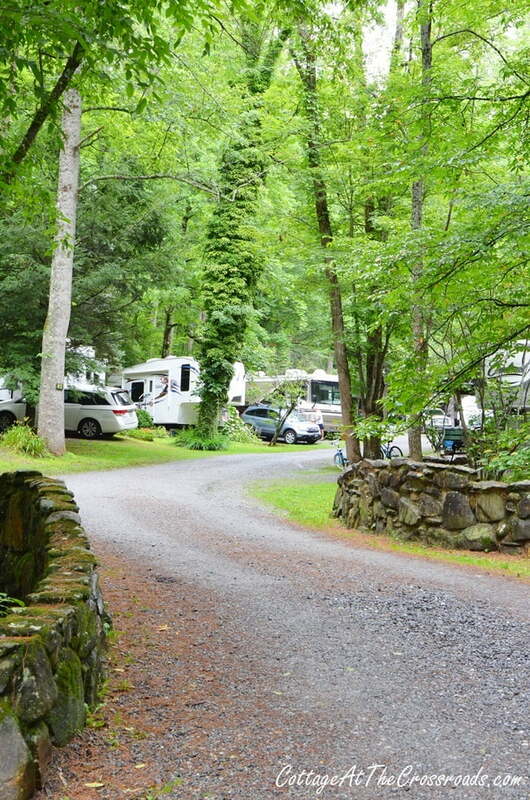 The campground is located in Balsam, NC which is not too far from Waynesville and Sylva. 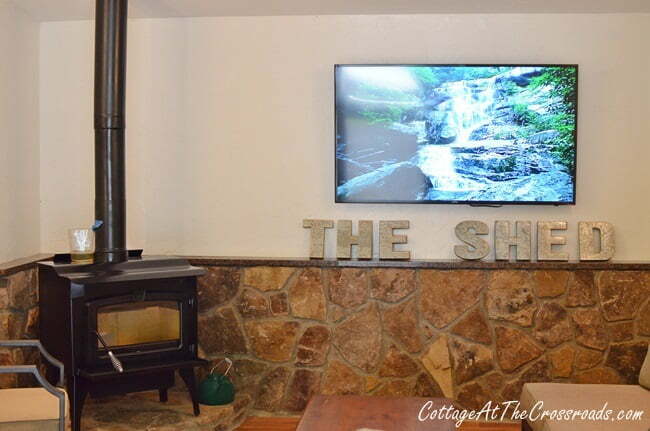 It’s nestled in a little canyon between the mountains and is an ideal getaway spot where you can just relax and disconnect from the world. 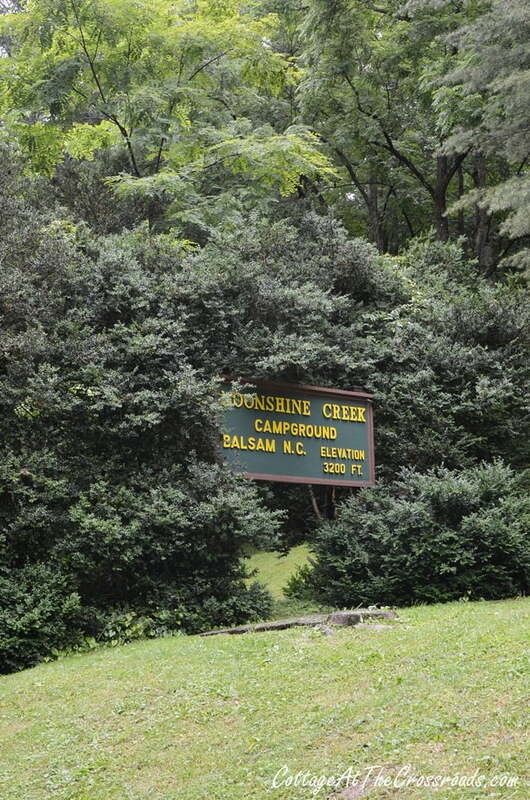 I found Moonshine Creek Campground by doing an online search for campgrounds located by a mountain stream. We were looking for a quiet place to unwind to celebrate our anniversary, and the campground turned out to be exactly what we wanted. From the moment we checked into the office, we were greeted by a friendly staff and were escorted by golf cart to our site. The staff member leads you to your site and give you precise direction on how to back into it. That is a BIG help for newbie RV owners like us! In case you missed this post, you can read all about OUR NEW MINI MOTORHOME. 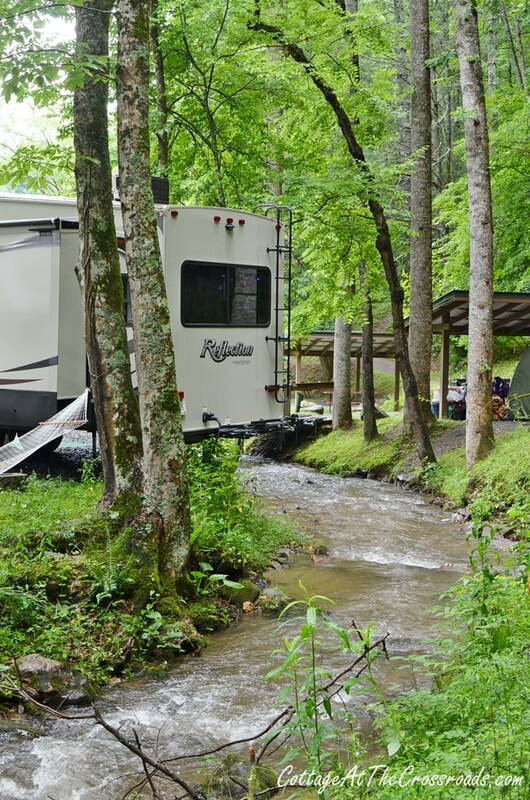 Most every campsite is located on Moonshine Creek which meanders throughout the campground. The majority of the sites have full hookups for sewer, water, and electricity but there is an extra charge for cable TV. There are even small furnished cabins to rent if you don’t own a RV. This was our view which was just steps away from the back door of our motorhome. 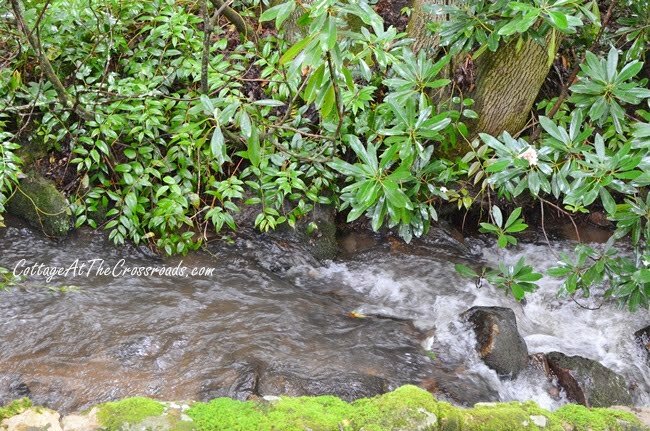 The sound of the rushing water was so relaxing, and you can imagine how wonderful it was to be lulled to sleep by it. This big rig was literally hanging over the creek! 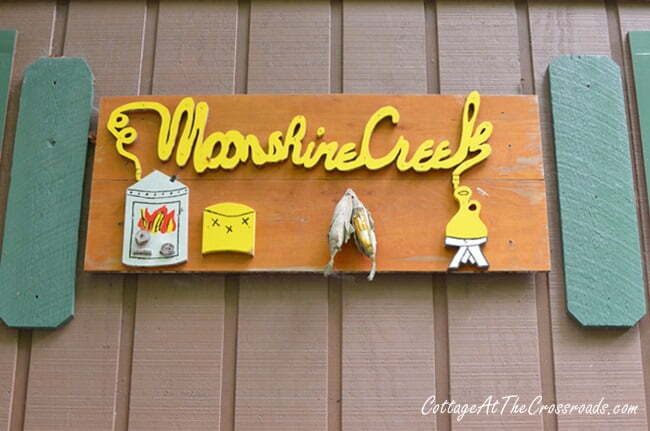 The name of the creek really is Moonshine Creek and there was even an old moonshine still located on the grounds of the campground. 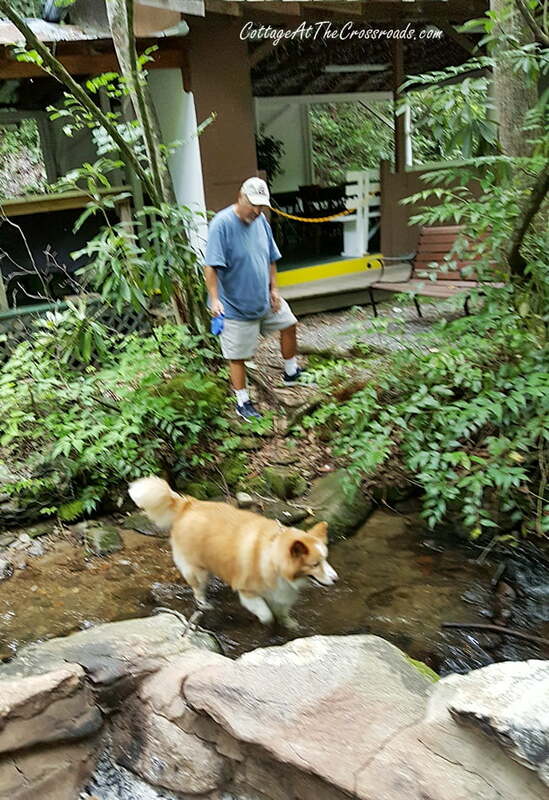 Leo and I were looking forward to sticking our feet in the cool mountain water, and apparently we weren’t the only ones! 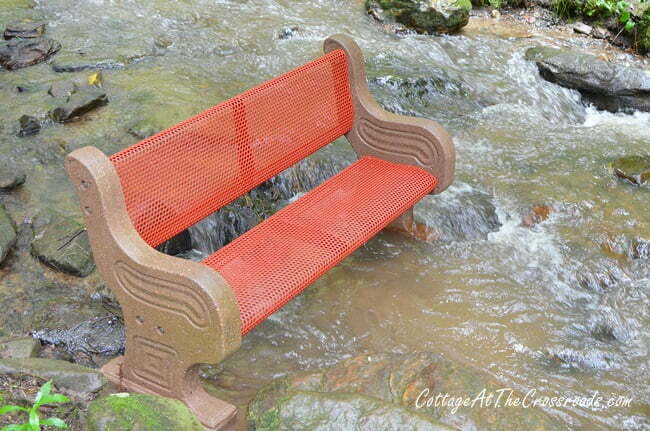 Imagine my delight in finding this bench that was already anchored in the stream! Lucy had the same idea,too! 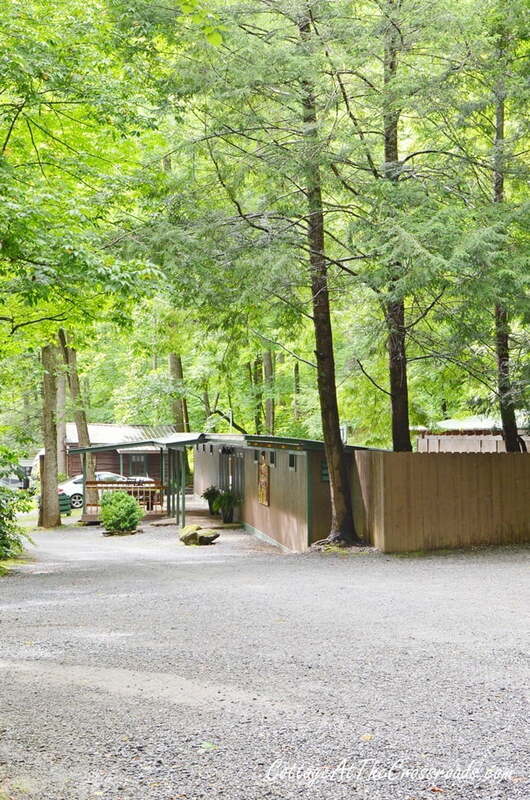 The campground is very pet friendly with no restrictions on the size or breed of dog. They are required to be on a leash and their waste must be picked up! Seems like most everybody had a fur baby when we were there. I do want to mention that children are not allowed to wade in the stream, though. 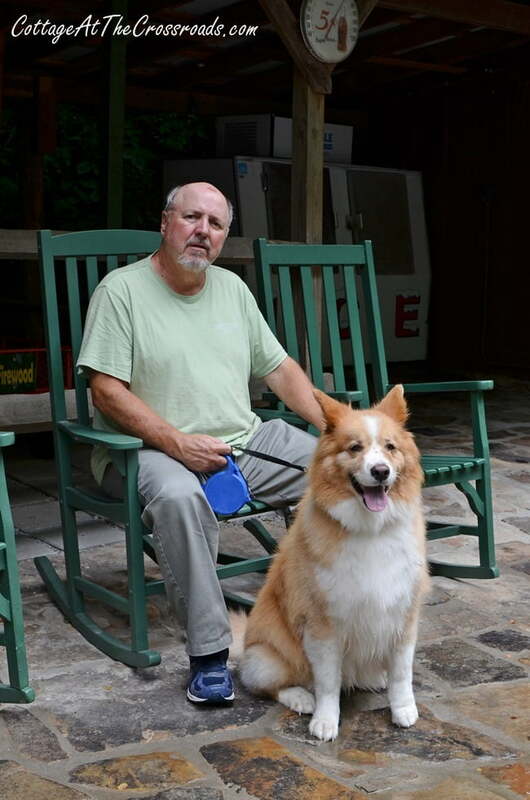 We met Jimmy Cobb, a pet photographer, while there and he took some photos of Lucy and later emailed them to us. 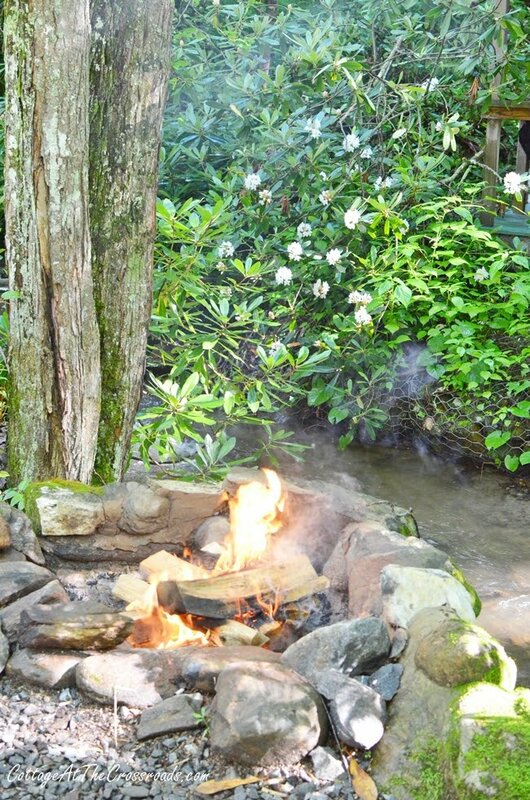 Most every campsite has a fire ring. Ours was right at the edge of the stream. The staff delivered the firewood to us soon after our arrival. It rained one of the days we were there and after it cleared out, we built a fire. 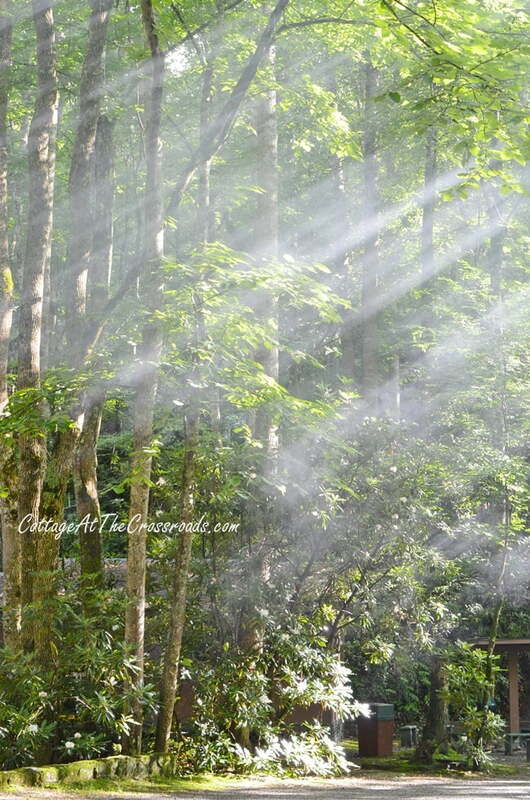 I was able to capture the ethereal looking smoke rising in the woods. 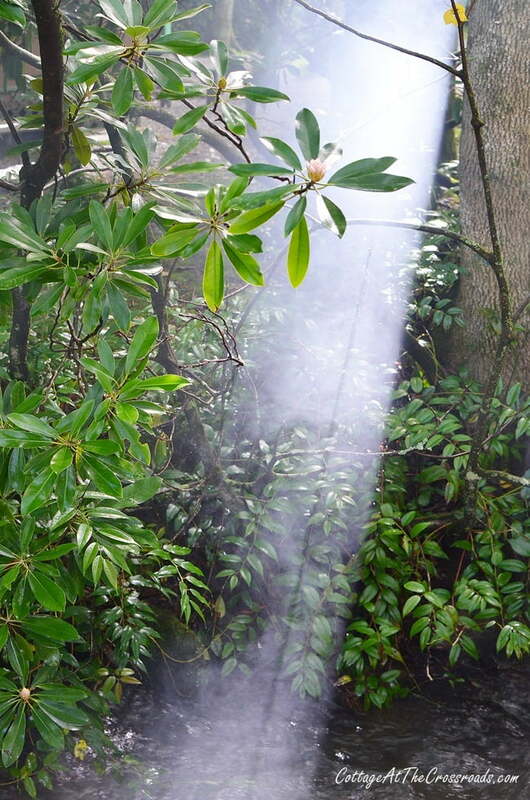 I’m not sure this photo adequately captured the beauty of the smoke and sunlight streaming through the woods. 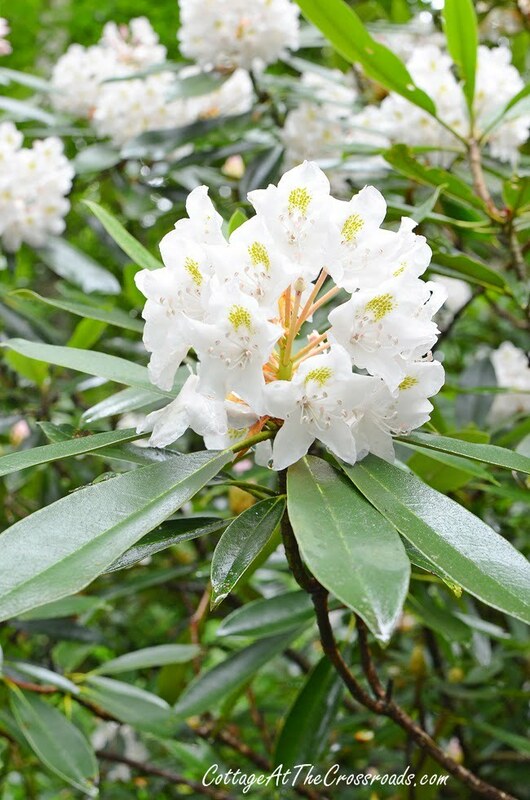 Rhododendrums were blooming throughout the woods, and they were spectacular. In the tent camping section, there are covered shelters that you can set your tent up under or you can use it as a sitting area. The campground is friendly to bikers, too, and I saw a few of them while there. 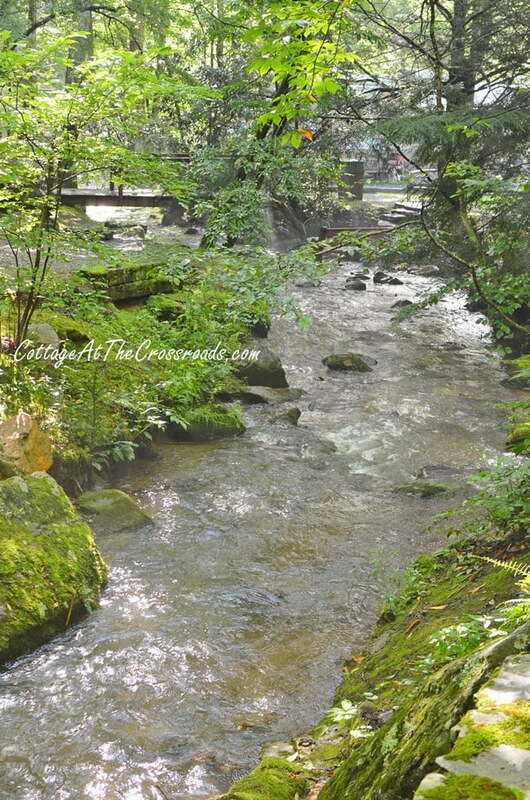 There are a number of footbridges over the creek along with some open play areas. 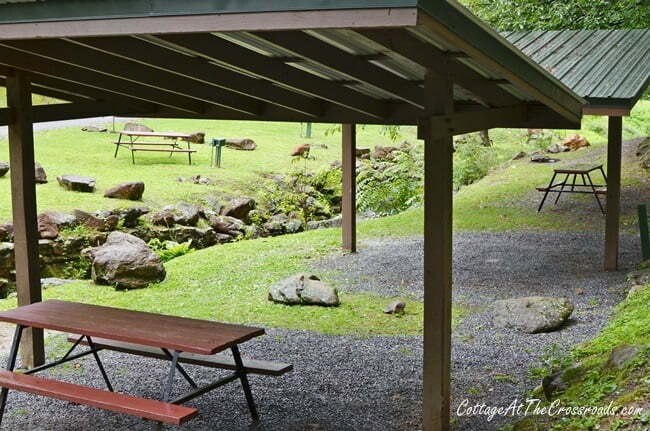 This is not a resort campground at all but a place to enjoy simple pleasures in nature. Near the office, there was a gathering room with a tv. I can just imagine sitting around this woodstove during the fall with a football game! Now for the important part! The bath house was centrally located and looks a little rustic in this photo but don’t let that fool you! It was completely modern and spotless with a wonderful laundry facility outfitted with new washers and dryers. I was super impressed with it! In front of it is a metal covered deck. While it was raining, we enjoyed sitting under it in rocking chairs and a train happened to pass by. You could barely see it moving through the woods but you could hear the whistle! 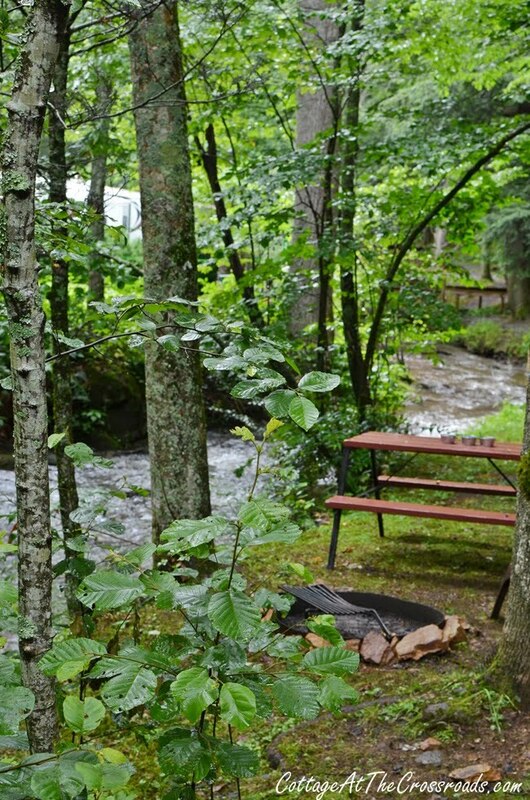 Moonshine Creek Campground is a great destination if you are looking for a quiet, peaceful place to unwind and enjoy nature. 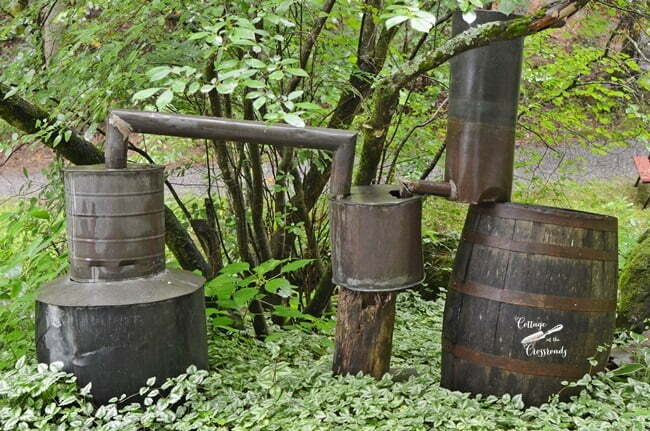 But it would also serve as a great base to explore the many attractions that are located nearby such as a the Blue Ridge Parkway. Now on to our misfortunes after returning from our trip. Lightning ran into our house TWICE this month damaging our TVs and other electronic equipment. I had to call EMS for my mom TWICE with her being admitted into the hospital on the last trip. Since returning home, she has needed almost round the clock care. And we’ve had to let the garden go because there has simply been no time to gather or work in it. Hoping August is a much better month! This campground looks like a place Carl & I would enjoy. However, we would have to go the cabin route. So sorry to hear about your mom’s health. I’m praying right now. 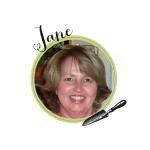 Jane, I’m days late reading this…so sorry. Your time in North Carolina sounds wonderful. That campground is amazing! I’m sorry to hear that your mom isn’t doing well. I hope her health improves. 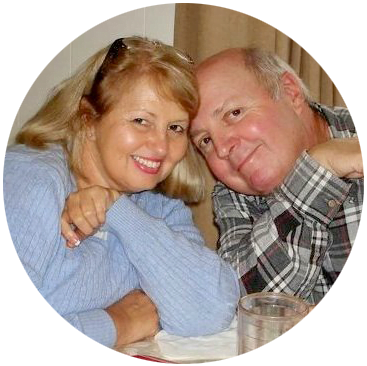 Often times when I disappear from the blog it’s because we are caring for one of our parents. My husband’s dad has Alzheimer’s and it’s sure a challenge. Jane,Thank you for sharing about your wonderful little getaway for your anniversary. I’m so sorry to hear about your misfortunes. My prayers are with you and Leo and for your mother. I hope she’s doing better. I’m also praying for a windfall for you, that you would be doubly blessed with your insurance and you would receive additional money from all the damages. Hey Jane and Leo, Thanks for the campground review. Sounds like something Ray and I might check out. I am so sorry to hear about your Mom. She will be in my prayers. We do too..and blessed to have a darling little vacation home right down the road. 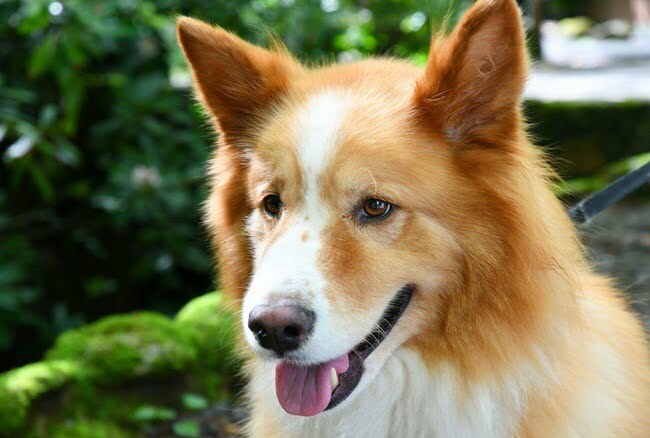 A wee word of caution..watch out for snakes..my moms dog was bit by a copperhead..sunning on a rock..no fun! Enjoyed the photos so much! It sounds like a very relaxing place to visit!! I do love the GSMs!! So sorry about your misfortunes and will be praying for your mom on a full recovery!! So sorry about your recent troubles. Your campground review was inspiring. Jane, I am so sorry about your Mom. I am glad you were able to get away to celebrate your anniversary!! I hope the rest of the summer will be better for you. I always enjoy reading your blog???????????? Beautiful camp ground! I will have to pass it along to friends that live in NC. Here’s hoping August is a better month! 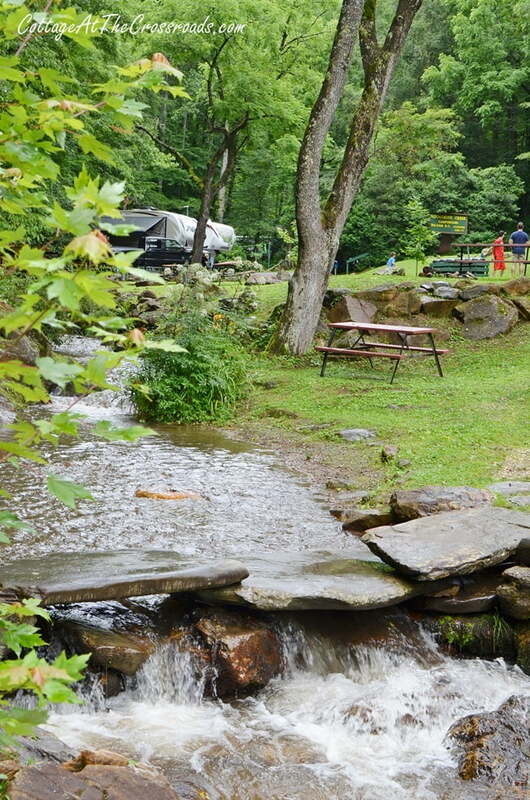 What a beautiful campground! The pics make me want to be there; however, it is too far away from where we are. My husband says he’s through with our R.V., so it is now for sale. I miss it but his health isn’t conducive to the work of camping. It’s motels & B&B’s for us. Boy, you folks have been hlt hard in July. 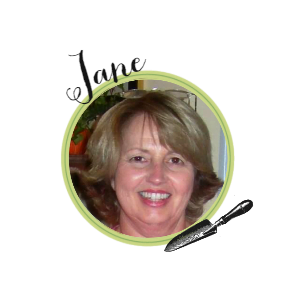 Prayers are going up for your mom & you. Looks like a beautiful and calming campsite. Thanks for sharing. Sorry to hear about your Mom. So glad you shared photos. I love your blog and look forward to each one. Take care. Looks like a wonderful place. Hope August is a better month for you. Thank you for this inspiring post. 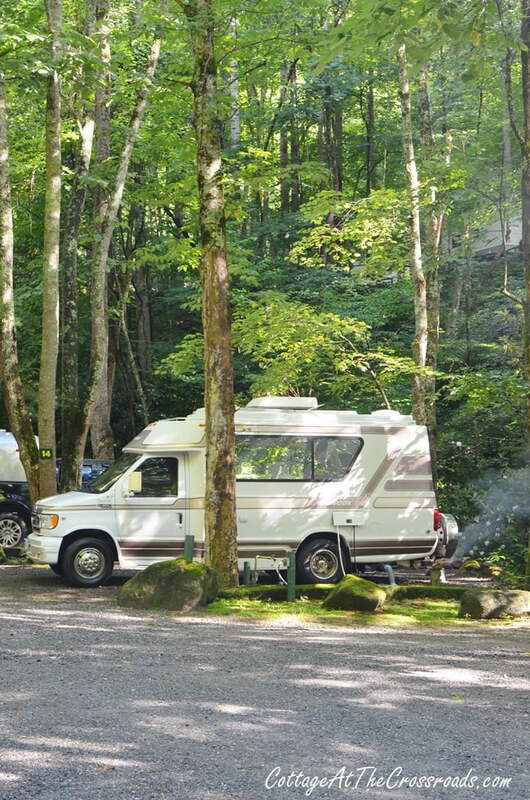 Sadly, I had no idea such campgrounds existed; perhaps not many are actually this nice! I’m recently widowed and this campground seems like a safe, beautiful destination. Your troubles with lightning strikes and your mother’s health issues are serious and sad. Life always presents challenges even alongside the blessings. I’m grateful for your beautiful photos, details, and your honesty.